*When used in conjunction with Y-Age Aeon and Y-Age Glutathione on a regular basis. For centuries human beings have searched for the elusive fountain of youth. But what if the answer to vibrant health and vitality could be found within our own bodies? 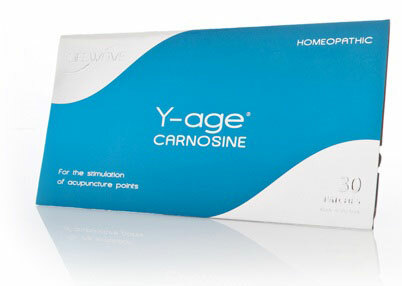 Carnosine is a naturally occurring nutrient in our bodies whose production declines with age. Clinical research on Carnosine has produced some amazing and dramatic results including the knowledge that Carnosine my be the principle nutrient for keeping the body young as we grow older. Carnosine has the unique ability to turn old cells into young and healthy cells! LifeWave has completed a bioelectrical impedance study of LifeWave Carnosine patches using an Electro Interstitial Scanning (EIS) system. This study showed that cellular physiological organ function (status), improved in eight of the ten tested organs. These results have never been available before LifeWave. I have seen the ACULIFE patches ELIMINATE MUSCULAR PAIN in a horse and take riders straight to the pay window over and over!